The Element Manager window lets you Opens the Element Manager window where you can add, delete or modify elements (drawing folders) in your scene. If you have drawing folders that are not linked to a column in your scene, use the Element Manager to delete them if needed. See xref Reference > Windows > Element Manager. For more information on working with this window, see Reordering Layers and Columns. Deletes the selected layer and its directories (drawing folder). Type in a new name in this field to create an element or to rename the selected element. Select this option if the new element is a vector drawing or if you want to enable the parameters on the selected element in the Elements list. Lets you select the file format of the bitmap layer. 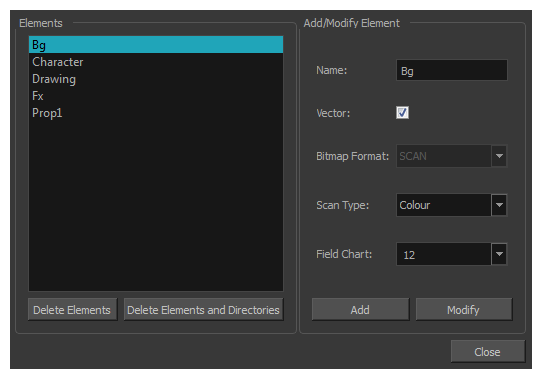 If you're planning to scan elements with the Toon Boom Harmony Scan module, select the scan type from the list. If you're importing traditional animation, select the size of the paper on which the animation was drawn. Creates a new element with the current parameters entered in the Add/Modify Element section. Applies the parameter changes made to the selected element.